We will be taking advantage of Hillhead 2016 to highlight the total solutions nature of our world-leading product ranges. This year will see a focus on mobile crushers and screens, as well as recent developments from Customer Services. Additionally there are a number of product launches planned, as well as live demonstrations in front of the stand. 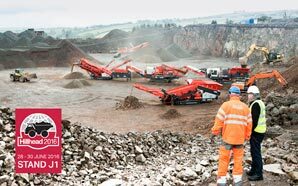 The Sandvik product offering provides solutions for virtually any application, and encompasses such diverse businesses areas as surface rock quarrying, excavation, tunnelling, demolition, recycling and civil engineering. The range of products developed to service these industries includes rock tools, drilling rigs, breakers, tunnelling equipment, crushing and screening machinery, bulk-materials handling systems - in fact equipment and support to deal with virtually every possible requirement. As the world’s leading “live-action” show, Hillhead 2016 will see us highlight the total solutions nature of our product ranges, with many market leaders being shown. Additionally a number of UK and Global product launches are planned. Live demonstrations of mobile crushing and screening equipment will be held in front of our stand, with other solutions also being demonstrated on the stand. With live demonstrations of some of the most important pieces of Sandvik equipment being held hourly directly in front of the main pavilion on the stand, a focus on providing solutions for our customers, Hillhead will certainly be a showcase event for Sandvik Construction in 2016. The Sandvik Construction stand will be located at: Stand J1 We look forward to seeing you in Buxton!